The Jonas Brothers head back out onto the road next week and will be out of the country traveling South American and Europe for the next two months, which means that American fans will be abnegated the boys’ comportment in their native country. Luckily, there are three lifelike doppelgangers stationed in Hollywood who will allow for visits any time (or at least during museum hours). 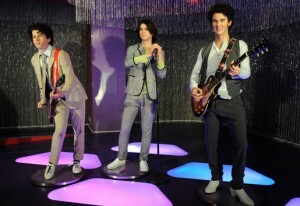 Yesterday (September 30), Madame Tussaud’s unveiled the wax figures of the pop-rock trio. The statues cost a total of $1 million to raise and feature actual clothes worn by the band (they presented a few outfits for the cause). This is not the first time the band has been given a wax tribute — they’ve already got wax replicas at the Madame Tussaud’s in Washington, D.C. (which introduced in 2008). In the 18 months in between the two carving premieres, the artists clearly haven’t figured out what to do with Nick, who is laid at an extremely odd angle. (The Washington interpretation also features his body shaped at odd angles.) He is an gumptious performer for sure, and is often caught up with photos in particularly unorthodox rock poses, but he really looks like he is got some troubles with his bone structure. The band took some time off from their tour for their most previous album Lines, Vines and Trying Times to go film the sequel to “Camp Rock” up in Canada. Now that they have absorbed up, their tour takes them to a few U.S. dates before they break out their passports for stops in Mexico, Venezuela and a number of cities in Europe.